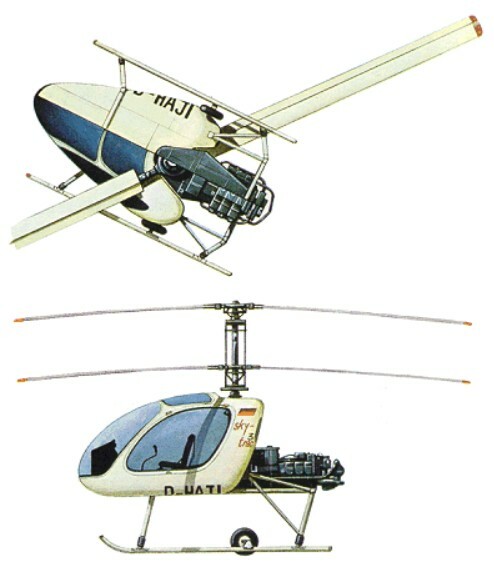 The first five designs evolved by Alfred Vogt of the Helicopter Technik Wagner since the company's formation in 1960 included two experimental helicopters, each powered by a 95hp rotary engine. One was a simple 2-seater with a skid undercarriage and pod-shaped body. 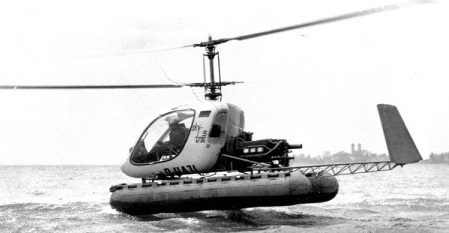 From this Wagner produced the Sky-Trac torque-less helicopter, which is basically a chassis frame carrying the engine and rotor system, to which a variety of cabins or equipment can be fitted to fulfil different roles. Development commenced in the mid-1960s as an offshoot of the Wagner firm's attempts to develop a roadable helicopter, and utilised the same coaxial dynamic components that had been developed for that project. Each design utilized a contra-rotating rotor system in which the lower three-blade rotor was attached to the crankcase of a 95 hp three-cylinder rotary engine, rotating around the rotor pylon, with the upper two-blade rotor driven by the crankshaft. The Skytrac featured a narrow single-seat cabin at one end of a box-like "keel" structure, a horizontally mounted Franklin flat-6 engine at the other end, and the transmission and rotor mast between them. The pilot's seat was enclosed by a sliding, bubble canopy. The prototype flew in this form in July 1965.The Wagner Sky-Trac 1 (D-HAJE), still had a frame structure but was fitted with a 260hp Franklin 6AS-335-B engine, and had a sliding canopy forming an enclosed cabin for the single pilot. Prototypes of the Sky-Trac 1 (D-HAJE) and Sky-Trac 3 (D-HAJI) were exhibited publicly for the first time at the Hanover Air Show in May 1966. The second machine built (D-HARB) was fitted with a pontoon landing gear and a longer boom with a V-tail. Both are powered by similar 260hp Franklin 6AS-335-B piston-engines, the Sky-Trac 1 being a single-seater with a 'goldfish bowl' moulded canopy, open at the rear. 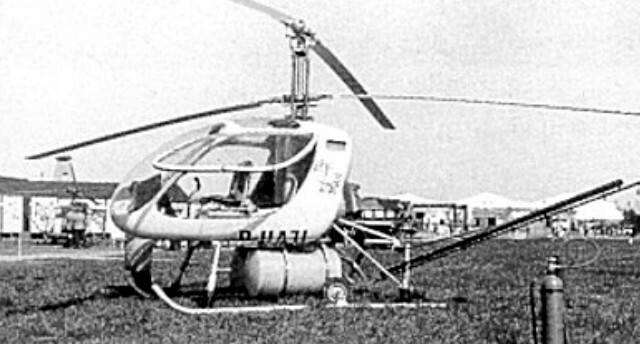 The three-seat Sky-Trac 3 (D-HAJI c/n 11), also flown in 1965, had a more complete cabin structure, faired-in at the back and underneath, and was fitted with spray bars and under-slung tanks for agricultural chemicals. The Sky-Trac 3 can lift loads at least equivalent to its own weight, an under-fuselage hook permitting slung loads of over 700kg to be transported. Alternatively, the heart-shaped cabin can accommodate a stretcher and medical attendant in addition to the pilot, or for agricultural use can be fitted with spray bars and an under-slung tank holding 650 litres of liquid chemicals. The HTM FJ-Skytrac received both German and FAA certificationin 1969. The company developed a kit to convert the Skytrac into a four-seat light helicopter known as the HTM Skyrider. 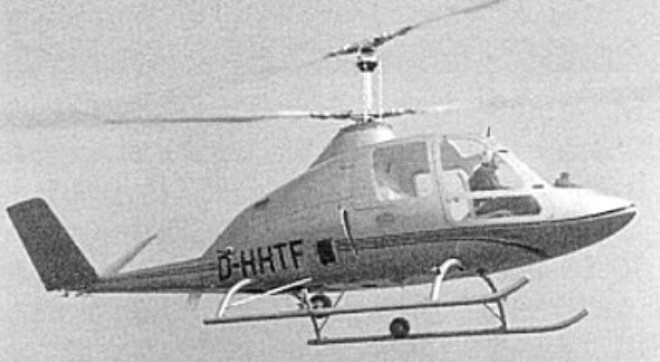 On 21 February 1974 Helicopter Technik München flew the prototype (D-HHTF) of the HTM Skyrider four-seater powered by a 260-hp (194-kW) Avco Lycoming engine. After extensive development work had been carried out, the Wagner designs were passed to a new company, Helikopter Technik Munchen (HTM) in 1971. HTM abandoned the Aerocar, but built a new prototype of the FJ-Sky-Trac (D-HHTM) in tandem two-seat configuration, as a utility helicopter with a 260hp Lycoming IO-540 engine. This still had the coaxial rotor system but was extensively redesigned to accommodate the new engine and cockpit layout. 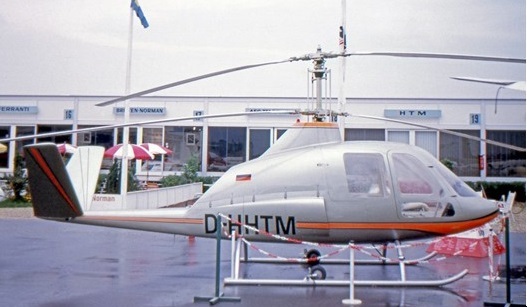 In 1971, the newly formed Helikopter Technik München (HTM) took over the manufacture and marketing of the Skytrac, announcing in mid-1972 that a production line was being established at Jesenwang with the intention of producing 35 machines by the end of 1973, all of which had found buyers. After this initial batch, HTM planned to sell licences to produce the design in batches of 30 machines each. None of this was to come to pass, however, as HTM was unable to finance the production of the first batch of aircraft. HTM then went on to build two examples of the HTM Skyrider (D-HTMS and D-HHTF) which reverted to the configuration of the Sky-Trac with a four-seat cabin and a fully enclosed streamlined structure. Mockups of this configuration were displayed at the Hanover and Cannes airshows in 1972 and a prototype was exhibited at the June 1973 Paris Air Show. The Skyrider had a skid undercarriage and V-tail, which commenced flight testing on 21 February 1974.It was possible to convert the basic Skytrac into a Skyrider in a matter of only a few hours' work. The Sky-Trac 1 and Sky-Trac 3 were used by HTM to demonstrate the concept, and a new prototype of the Sky-Trac (D-HHTM) was built in tandem two-seat configuration, as a utility helicopter with a 260 h.p. Lycoming 10-540 engine. This still had the coaxial rotor system but was extensively redesigned to accommodate the new engine and cockpit layout. Since 1992 all the rights for production and design of the Skytrac and Skyrider helicopters are owned by Mr. P. Chrobak.